Computer Services of Durant, Inc. - About Computer Services of Durant, Inc.
About Computer Services of Durant, Inc.
Computer Services of Durant, Inc. is a small business located in Durant, Oklahoma. The firm specializes in computer repair, computer sales, website hosting and website design in the Texoma area and beyond. To provide distinctive quality and unparalleled customer service in the technology industry, as we strive to gain the respect and trust of our customers, suppliers, and other members of the communities we service. 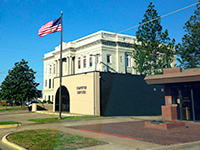 In September of 2003, Chris Pierce took his existing business (Chris Pierce Consulting), and expanded it with the help of local businessman, James Dunegan, to form Computer Services of Durant, Inc. The partnership took Pierce's already successful service business and added a reseller agreement with Dell Computer, Inc. along with added services in the website hosting and website design industries. Chris purchased the remainder of the business from his partners in January, 2008. The company remains successful and continues to help promote technology to the communities it serves. In 2013 the company celebrated 10 years of service and moved to the new location of 211 N 4th Avenue.